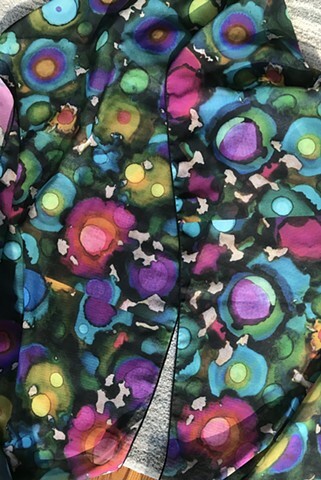 This design was featured at the 2018 Washington DC Gala. The actual artwork was sold and profits sent to JDRF. And now, the scarves are available. While most people can confidently name a variety of cells including brain cells, skin cells, liver cells, white blood cells, and assert that each is critical to a person’s health, beta cells tend to remain in relative anonymity. Even among the millions of Americans living with type one diabetes (T1D), beta cells are rarely a conversation topic. 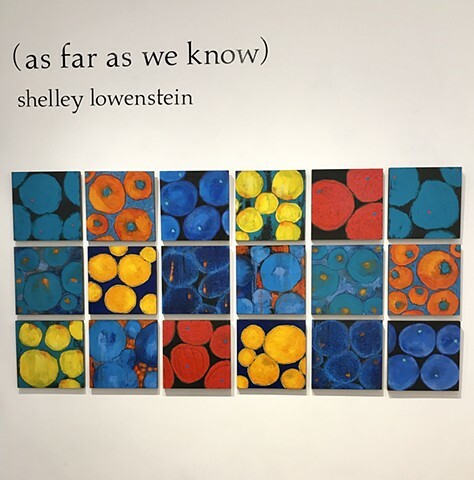 Shelley Lowenstein aims to elevate awareness of beta cells through her art. A spring 2018 exhibition of this work was held at Touchstone Gallery in Washington, D.C., sparking great interest. Shelley Lowenstein’s daughter was diagnosed with T1D at the age of 14. As do many parents whose children have T1D, Shelley wanted to help improve diabetes care, and help find a cure by raising awareness. A writer by trade, Shelley began writing about T1D for various publications. She frequently contributed to the children’s section of the American Diabetes Association magazine, and once wrote a column for Newsweek about her family living with T1D. By coincidence, around the time of Shelley’s daughter’s diagnosis, a nationally acclaimed artist in Shelley’s neighborhood was teaching classes. Shelley took the classes and began producing art seriously. It helped her focus on her work and family. While Shelley continued to write about T1D, painting remained strictly a creative outlet. That was until a couple years ago. “For years and years I’ve been a figurative painter, painting people, and places. Eventually, I needed a break from that, and since I usually told stories about people and places, I decided to tell the story of the beta cell,” recalled Shelley. Describing her approach to the subject, Shelley said, “Working at National Geographic and Discovery had a profound impact on me. When I was given an assignment, it was usually about science and I developed a love of it [science]. I had to talk to a lot of scientists and that experience carried over into how I began learning about beta cells.” Perhaps paraphrasing Aristotle, Albert Einstein once said “The more I learn, the more I realize how much I don’t know.” Shelley would attest to the statement’s validity, as she found through her many interactions with scientists that although knowledge about beta cells has exploded in recent years, there is so much more we don’t know. Hence, her show’s title “(as far as we know)”. Back to work in September.